The year 2009 has been a extraordinary one, particularly for the staff and children of Al-Shurooq School. There is an enormous difference between the past and the present. The blind and visually impaired of Palestine now have a beautiful adapted building that opens up many opportunities for teaching and developing skills of the visually impaired of all ages. For the last 14 years, and ever since the annulment of the agreement between Bible Lands' Society and the National Society for the Visually Handicapped, the conditions we went through have not been at all easy. It was a struggle that required a great deal of courage and perseverance; but we took the risk out of our conviction that "Those who trust the Lord will never fail". What has been achieved in such a short period is a wonderful proof of God's promise to mankind. We are indeed extremely lucky to be in such a fabulous building with all its modern facilities and services. Needless to say that there is still much to be done. There were many other items that we were obliged to purchase, and of course all that is costing us a great deal more than we ever anticipated. So we are most grateful to our friends who have covered the major costs of these items. It is Christmas Eve, and here in Bethlehem, people are gathering from all around the vicinity to meet and welcome the Catholic Patriarch, who comes into Bethlehem from Jerusalem in a procession, and crowds of people accompanied by the different scouts and the celebrities walk through the streets of Bethlehem up to Manger Square. In order to give our children the feel and experience of these celebrations, we made arrangements for our ten and eleven-year-olds to be part of that procession. They enjoyed the experience tremendously. Last Sunday, December 20th, was the highlight of the season for our children; it was the YMCA's annual Christmas party. 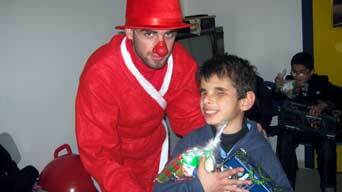 It was the 59th year that the YMCA has done this for children in and around Jerusalem. 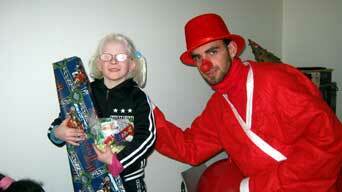 The party went very well, our children had gifts THEY could enjoy and kept US upbeat!! Each children received a set of drums, horns, rattles and a xylophone, so it’s easy to imagine the wonderful sound of music around the school. To Jerusalem, we had no problem going through the check point; no one had to get out the bus for inspection. The whole event was very well-organised, and we thank all those who worked so hard to give the children of the area a genuine feel of Christmas. Our Christmas party took place on December 29th . We had with us several former Al-Shurooq children who have joined inclusive education in former years, in addition to a few guests. After lunch, the children gathered in our multi-purpose hall and sang Christmas carols anxiously waiting for Santa to arrive. Santa soon paid his visit, bringing a gift for each child. We are indeed profoundly grateful to all our friends who donated extra money to enable us to purchase the gifts and have the Christmas lunch. This time last year, also on the 29th of December, we remember the brutal destructive war on Gaza and its people, who are still suffering until today. When two of our children, Lara and her brother Ahmad (Joujou) were prevented from going home the last minute, they were obliged to stay at school during the whole period of their Christmas holidays. It was a dreadful situation. Although we were glad that they escaped the war, yet we are quite certain that they must have suffer immensely on the quiet. 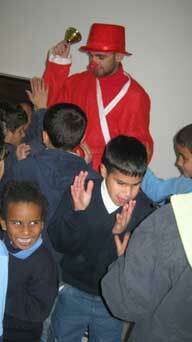 Ahmad (Joujou) receiving his gift from Santa. We celebrated the opening of the new building on October the 15th, 2009, under the auspices of his Excellency the Palestinian Prime Minister Dr. Salam Fayyad. It was a very pleasant occasion and very well-organised. Many local and international institutes were represented at the opening, especially those who support or have supported the school in the past. However, we were rather disappointed as quite a number of our friends, particularly those who have had a tremendous influence on our work were unable to attend, since it all happened within very short notice from the Prime Minister's office. However, we were delighted to have the Church of Scotland represented by the Revd. George Shand, the Minister of St. Andrew's Jerusalem and Mr. James Laing. We were also privileged to have with us our faithful and long-term friends Barbara and Tom Davies from Wales. Both had and still have a tremendous impact on the work we have undertaken to perform. We so much wished that many more of our friends could have been there with us. They were certainly in our thoughts. Work in this department is going smoothly; there is always a great demand on the transcription of books and other materials. In the last three months, four hundred books have been printed and given out on loan, and thirteen new titles have been added to our library. Thank you friends and a happy New Year to you all.